"Common Challenges faced when Implementing an Enterprise Asset Management System"
Enterprise Asset Management probably is the least appreciated function in businesses and other entities. Implementing the enterprise asset management system can improve operations, reduce risks, and it can also be a source of competitive advantages. 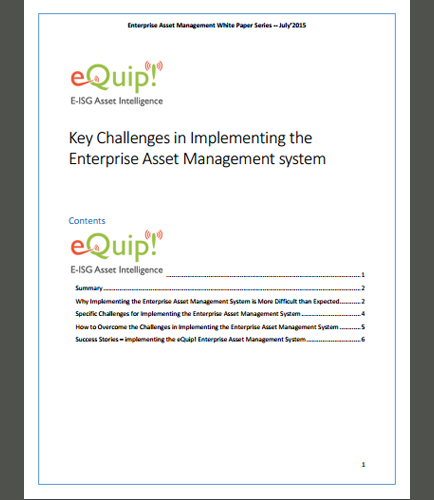 But, what are the key challenges in implementing the enterprise asset management system? More and more entities are realizing the value of improving the enterprise asset management function but the process of implementing the Enterprise Asset Management system has its unique challenges. This whitepaper will assist you to learn the best practices and challenges of implementing an enterprise asset management system in your organization to sustainably manage assets and asset systems. What’s inside this EAM whitepaper? Why Implementing an Enterprise Asset Management System is More challenging than Expected? Common Challenges faced when Implementing an Enterprise Asset Management System. How to Overcome the Challenges of Implementing an Enterprise Asset Management System? Success Story of implementing the eQuip! Enterprise Asset Management System.